NEW YORK, Jan. 22 /CSRwire/ - The Coca-Cola Company today announced that it has installed its 1 millionth hydrofluorocarbon (HFC)-free cooler using natural refrigerant in the marketplace, preventing the emission of 5.25 million metric tons of CO2 over 10 years. This milestone marks significant progress in the Company’s effort to phase out the use of HFC refrigerant—a well-known contributor to climate change—in Coca-Cola dispensers, vending machines and coolers globally. Together with its bottling partners, the Coca-Cola system has established a goal that all new cold-drink equipment will be HFC-free by 2015. Achieving this goal will prevent the emission of more than 50 million metric tons of CO2 over 10 years, an amount equivalent to the annual emissions of more than 10 million passenger vehicles. Coca-Cola has improved its cooling equipment energy efficiency by 40 percent since 2000; and eliminated 75 percent of direct greenhouse gas (GHG) emissions by transitioning to HFC-free insulation foam for new equipment. As part of its commitment to pursue more sustainable refrigeration, Coca-Cola selected CO2, a natural refrigerant that eliminates 99 percent of direct emissions, as its HFC-free, refrigerant choice for new equipment. The Company’s investment in more sustainable refrigeration has made CO2 technology a commercially viable option for the cold drink and food equipment industry. 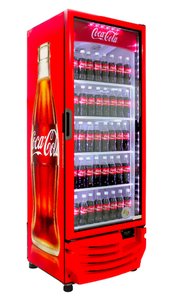 In 2013, Coca-Cola placed approximately 230,000 units of HFC-free equipment, bringing the global total to 1 million. While HFC-free placements are scaling-up worldwide, Europe and Japan have been market leaders for Coca-Cola to date. The Company also remains an active participant in Refrigerants Naturally!, a food and beverage industry alliance. Co-founded by The Coca-Cola Company in 2004 with support from United Nations Environment Programme (UNEP), this group addresses global climate change through promotion of HFC-free alternative refrigeration technologies. Currently, Antoine Azar, Sustainable Refrigeration Manager, The Coca-Cola Company, chairs Refrigerants, Naturally! This work complements the most recent goal set by the Company to reduce the carbon footprint of "the drink in your hand” by 25 percent by 2020. This goal includes working to reduce the greenhouse gas emissions across the entire value chain of Coca-Cola’s products by making comprehensive reductions in manufacturing processes, packaging formats, delivery fleet, refrigeration equipment and ingredient sourcing. In 2009, Coca-Cola set a goal that 100 percent of its new coolers and vending machines will be HFC-free by 2015 with support from Greenpeace. The Company also played an active role in setting the Consumer Goods Forum goal to begin phasing-out HFC refrigerants in cooling equipment across its 400-member companies starting in 2015. To learn more about our sustainability work, visit our 2012/2013 Sustainability Report. The Coca-Cola Company (NYSE: KO) is the world's largest beverage company, refreshing consumers with more than 500 sparkling and still brands. Led by Coca-Cola, one of the world's most valuable and recognizable brands, our Company's portfolio features 16 billion-dollar brands including Diet Coke, Fanta, Sprite, Coca-Cola Zero, vitaminwater, Powerade, Minute Maid, Simply, Georgia and Del Valle. Globally, we are the No. 1 provider of sparkling beverages, ready-to-drink coffees, and juices and juice drinks. Through the world's largest beverage distribution system, consumers in more than 200 countries enjoy our beverages at a rate of 1.9 billion servings a day. With an enduring commitment to building sustainable communities, our Company is focused on initiatives that reduce our environmental footprint, support active, healthy living, create a safe, inclusive work environment for our associates and enhance the economic development of the communities where we operate. Together with our bottling partners, we rank among the world's top 10 private employers with more than 700,000 system associates. For more information, visit Coca-Cola Journey at www.coca-colacompany.com, follow us on Twitter at twitter.com/CocaColaCo, visit our blog, Coca-Cola Unbottled, at www.coca-colablog.com or find us on LinkedIn at linkedin.com/company/the-coca-cola-company. Live Positively: Our commitment to making a positive difference in the world.